John Miller and his crew arrived at 8:30 with his Landoll. Despite the tight space, Donny Miller maneuvered it into position on his first pass. 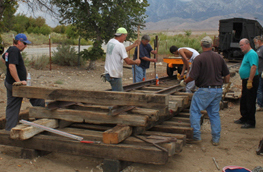 The train specialists took about 20 minutes to build temporary tracks and to secure them to the bed of the Landoll. 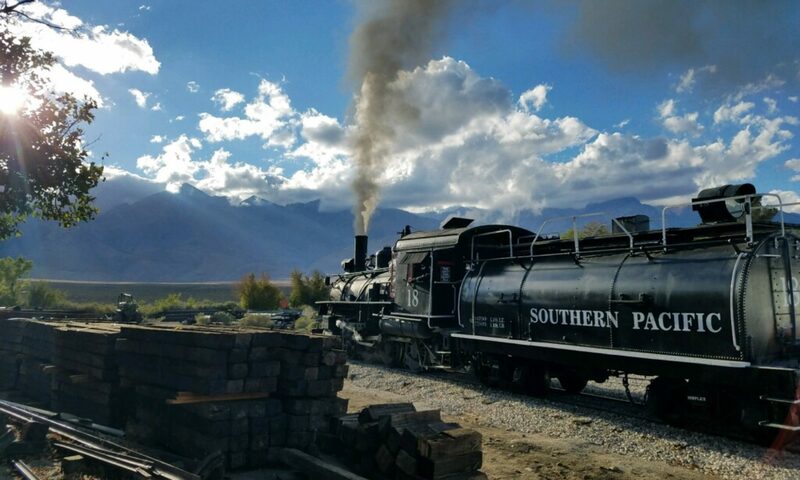 Another 15 minutes and John had the tender loaded. 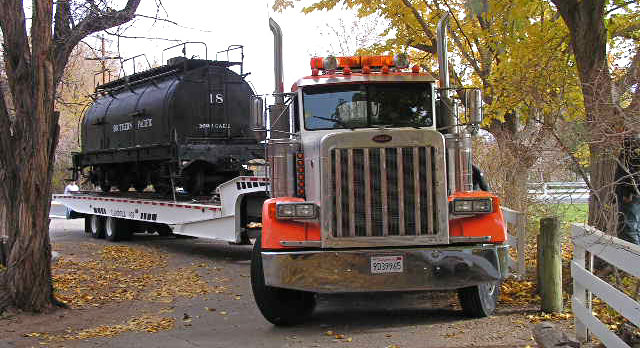 Backing out was more difficult – the rear axles had to be moved forward to shorten the wheel base – but it didn’t take more than half an hour to transport the tender to our yard at the Eastern Sierra Museum. Unloading took about an hour and seemed quite dangerous, especially when a rail end snapped. But all went well. 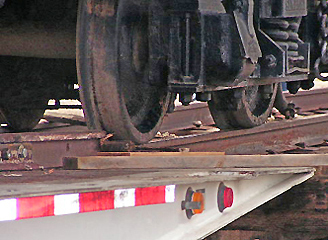 John used his medium duty International to pull the tender forward while the winch on the Landoll controlled backward movement. 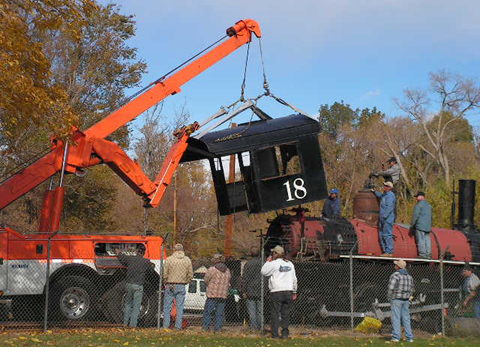 We returned to Dehy Park and John used his large tow truck to remove the locomotive cab and load it onto the trailer. It took about a half an hour but most of that was used to remove bolts which escaped previous notice and to free various obstructions. All told it took no more than 3 hours to do the whole job. It’s worth noting how important the modern equipment and crew expertise were. Had we tried to do things the way they’d been done in 1955 we would have had to dig trenches, build ramps, and partially close 395. It would have taken days…Oh, by the way, John Miller and his crew DONATED their time. Rolled engine back about 6 feet to get away from the front fence. Loosened both boiler blow downs for upcoming lapping and rebuilding. Loosened all boiler plugs and numbered for upcoming boiler interior wash. 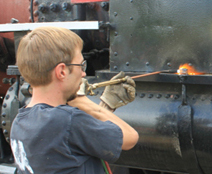 Removed both steam delivery pipes in smokebox to facilitate tube removal. Removed smokebox front for tube removal. Began needle scaling rust around staybolt caps and where cab mounted on wrapper sheet. Cut out about 40% of tubes. Built stairs up to cab floor for easier working. 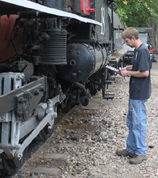 All air brake valves are in Durango and have just begun the rebuilding process by D&S air brake mechanic Chris Brophy. 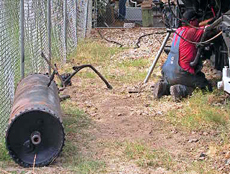 Cab is in Olancha and will be thoroughly documented as per locations of electrical, stripped, sandblasted have the metal repaired and primered. This is phase 1 of the cab project that will likely take 1-1 1/2 years. Classification lamps are being rebuilt for ultimate operation and more immediately for display at the museum. All cab windows are being repaired/rebuilt by Dennis Burke. 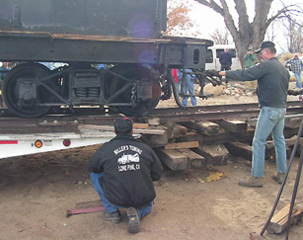 Tender ice box is being rebuilt by Dennis Burke as well. Gerry Mulryan of Mohave is beginning to build a new pair of water glass valves to match the existing ones and go with our newly donated water glass. removed final bit of plumbing around boiler and cab, including all air lines, injector feed and overflow lines and fuel heater and atomizer lines. took out both tender and loco draw bar pins, and unhooked all connections between engine and tender except fuel line. This may look easy but it wasn’t. You have to understand what to remove and how to deal with problems. For example, no one has put a wrench to these nuts in more than 50 years and not all of them came off easily. Force them and you risk breaking studs. So the crew first heated them, then poured water on them, then – if necessary – ground them down enough to break them. By the end of the weekend the tender and cab were ready to move, and the tubes to be cut out. The boiler is completely clear with the exception of a couple of brackets. Both injectors are at the V&TRR being rebuilt and all the air valves are in Durango for rebuilding. 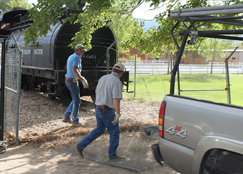 Doug Mull and Supervisor Marty Fortney built and installed the gates which will allow us to move the tender. 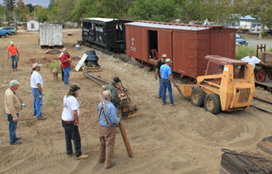 About 8 people layed track and moved the boxcars. Again, it may look simple but it isn’t. 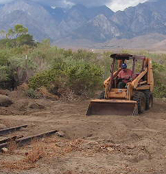 You have to know how to lay track and how to improvise – such as moving the cars with the skidsteer. Finally, music…and this didn’t happen spontaneously either. A damn good day…which allows us to arrange for the removal of the tender’s bunker oil and schedule the next work day for November. 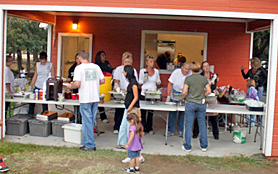 As of today – October 22,2010 – we’ve raised about $25,000 since October 2…including a 20k donation by an anonymous donor. He’s promised us an additional 20k for each of the next 4 years and has challenged the rest of us to match him. 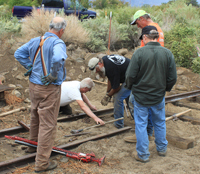 If we’re successful we’ll raise enough to cover the cost of locomotive restoration and have enough left over to lay track.